Artemas Ward was a military man, a court justice, and a politician. The School of Public Affairs building bears his name, and AU celebrates Artie Ward Week each fall in his honor. However, most students, faculty, and staff wonder who Ward was and what connection he has with the university. University Archivist Susan McElrath has a clear answer for these questions. Absolutely no connection? It can’t be. McElrath, though, remains adamant. For some members of the AU family, this news may come as a shock – like suddenly realizing a beloved second cousin was really just a friendly neighbor who stopped in for meatloaf every now and then. The man certainly had a storied life and career, but his story simply never included AU. Born to a successful farmer/sea captain/lawyer in 1727 Massachusetts, Ward graduated from Harvard and had eight children. He served as a State Court Justice, member of the US House of Representatives, and first Commander-in-Chief of the American Armies, preceding George Washington. Ward died at his home in 1800. Of course, like any great general, he needed a statue. That’s where his great-grandson and alma mater set a path toward AU. After donating the Ward House and over $4 million to Harvard, the great-grandson stipulated that the university had to erect a statue to commemorate the general. Harvard commissioned the statue but – in the end – didn’t keep it. 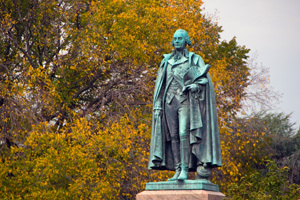 In 1938, the National Capital Park and Planning Commission placed the statue in the then open circle at Massachusetts and Nebraska Avenue, where the Massachusetts native would be most comfortable. It wasn’t without some resistance, however, that Ward’s likeness arrived. Neighbors bristled at the idea of another military tribute in DC. Still, Ward joined the neighborhood and – in doing so – became part of AU’s identity. Fast forward to present day: the Ward Circle Building houses the School of Public Affairs, and since 1993, the campus has celebrated Artemas Ward every fall with a series of programs and events bearing his name. AU Student Government Vice President Liz Richards sees the connection as something more than just proximity to a statue. It all comes down to mission; Ward’s was to be a civil servant, serving his country, and AU’s is to create civil servants, graduates who go on to serve their communities no matter what their career paths. So, while the historical connection may not be there, American University shares a true heart for service with General Ward. If nothing else, that’s enough to make him family.